Show the passage of time in a visual way from seconds to years, including moon phases, seasons and solstices. The Annual Clock is a beautiful and fascinating way to demonstrate the passage of time. Inspired by astronomical clocks of centuries past the Annual Clock depicts the passage of seconds, minutes, hours, daylight, days, moon phases, months and seasons. 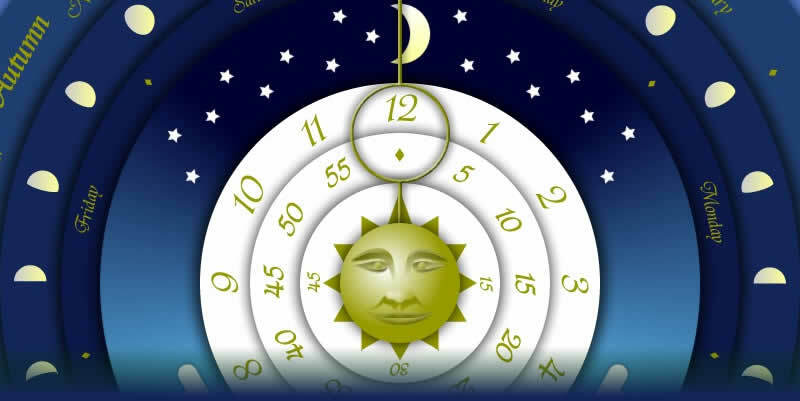 Complex formulas predict events such as Easter, the Solstices and the Equinoxes which occur on different dates each year, and the moon phases which do not occur precisely in line with calendar days. Students can download the clock as a screensaver for their own computer. Recommended: Computer with projector, Internet Browser with Flash Plug in and Internet Access. Minimum required: Computer with monitor visible to class/group, Internet Browser with Flash Plug in, Internet Access. Researching the formulas required to predict non-calendar events such as solstices, equinoxes and Easter was both challenging and interesting. My particular thanks go to Jean Meeus and NASA for the astronomical formulas and data I could never have discovered on my own, and also to Utrecht University for their formula to convert Julian dates to Gregorian dates, all of which I was then able to implement in ActionScript for this project. I built the original release of this as a personal project when on holiday. I actually never intended this to be a teaching aid, but when I demonstrated it to my interactive media students it was a popular item. I promised then to make it available for them to download, and now here it is, nearly a year late, but hey I'm a teacher, I'm busy. Anyway, I hope you take as much pleasure in using it as I did in making it. But be careful, you may become addicted to simply watching time pass. This is a great way of introducing the concept of time and the passage of time. Now you can show all at once the passage of seconds, minutes, hours, daylight, days, moon phases, months, seasons and years... as it happens. Students can download and install the annual clock as a screensaver, a permanent reminder of your lesson, and important concepts.